← Is it Possible to Bet on Extreme Sports Events? Can you tell us a little bit about your early life? What was it like growing up in Devon? I was lucky enough to have a fantastic childhood. I grew up in Torbay, so beaches and the countryside were almost equally close for me. Mum and Dad always made sure the ‘weekend walk’ was on the timetable, so we’d be out and about exploring somewhere new and picturesque on a regular basis. One of the things I miss most about living in Moscow is it’s so far away to the seaside, so going back home is always a real pleasure. What first made you interested in Russia? We imagine there is quite a difference in culture and climate compared to where you grew up. Was it hard adjusting to the cold? Speaking of ice, I was lucky enough to experience Moscow’s coldest winter for a decade in 05/06 where it hit -35C quite regularly. The inside of your mouth and nose freeze and a gust of wind feels like the touch of death. It was a tad different to the chilly +8 or 9 I’d been used to in London! You explored a lot of Russia whilst making the Discovering Russia series. Do you have any memories or favourite locations that stick out in particular? It’s a cliché but there have been so many. I’ve explored over 50 regions here and the country’s size means you’re always experiencing something new. In Kamchatka, I travelled in the back of a rickety truck for 8 hours to see my first wild bear. In North Ossetia, I encountered the amazing hospitality of the Caucasus and went to a traditional ‘small’ wedding ceremony with a mere 500 people. I climbed mountains in Altae to visit what I thought was an isolated Buddhist monastery, where the head monk promptly told me England had been knocked out by Germany in the 2010 World Cup! 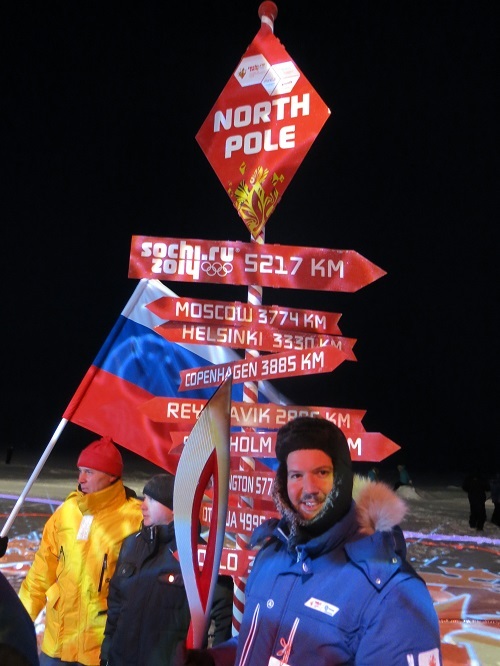 More recently I had the chance to be a torchbearer for the Sochi 2014 Winter Olympics and I even visited the North Pole on a Russian icebreaker. It’s rarely been dull, I can tell you that. Can you tell us a bit about your new TV show ‘Englishman vs Russia’? We’re trying to do a series where I tackle some of the more extreme environments and professions in Russia. 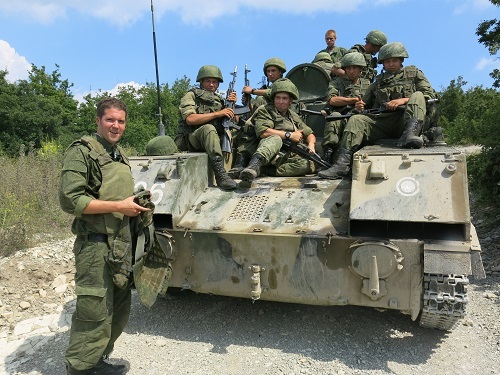 It stems from last year where I spent a few weeks with conscripts in the VDV, the Russian paratroop regiment. It was fascinating, albeit probably the toughest film I’ve ever made, and I wanted to do more ‘insider stories’ like it. I’ve recently finished a documentary working with lumberjacks in the northern forests and soon I’ll be on a working trawler with Barents Sea fishermen and blowing up buildings with demolition experts. It’s going to be an exciting few months! Do you have any advice for anyone who is planning on visiting Russia on an adventure style holiday? Russia is so diverse it’s perfect for adventure tourism. In the summer you can go mountain climbing, canyoning, take a hunting or fishing expedition or sail on its dozens of rivers. In the long winter, there’s skiing, snowboarding, ice fishing and, of course, plenty of vodka on hand to keep out the cold. If I had to recommend one place, I’d say try and get to Kamchatka. It’s a fantastic combination of indigenous culture, wildlife and spectacular scenery. The volcanoes there are something you’ll never forget. Hopefully, to keep making interesting and engaging films, finally get my Russian fluent and visit the last few regions I have left to see in this country! 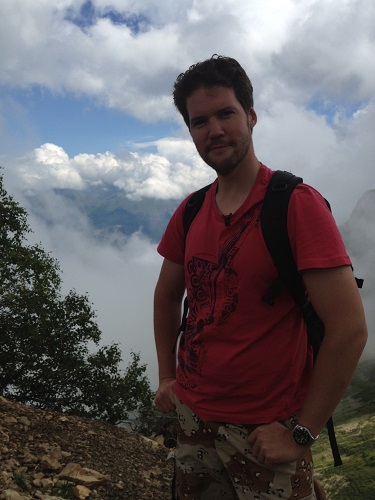 This entry was posted in Europe, Featured, News, Travel and tagged Adventurer, Discovering Russia, James Brown, Russia. Bookmark the permalink.